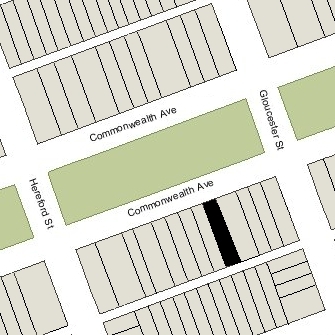 294 Commonwealth is located on the south side of Commonwealth, between Gloucester and Hereford, with 290 Commonwealth to the east and 296 Commonwealth to the west. 294 Commonwealth was designed by architect Samuel D. Kelley and built in 1880-1881 by brothers John W. Shapleigh and Samuel M. Shapleigh, carpenters and building contractors, for speculative sale, one of three contiguous houses (294-296-298 Commonwealth). Click here for an index to the deeds for 294 Commonwealth. On August 23, 1881, 294 Commonwealth was purchased from Samuel Shapleigh by Caleb Kimball Colby, a wholesale jeweler in New York City. He and his wife, Mehitable Batchelder (Young) Colby, lived in Brooklyn, New York. By the 1881-1882 winter season, 294 Commonwealth was the home of retired wholesale liquor dealer John S. Day and his wife, Evelyn Pauline (Young) Day. They previously had lived at 3 Wellington. Evelyn Day was the sister of Mehitable Colby. Their son, Stanton Day, a lawyer, lived with them. The Days continued to live at 294 Commonwealth during the 1890-1891 season, but moved thereafter to Brookline. On December 1, 1890, 294 Commonwealth was acquired from Caleb Colby by Elizabeth H. C. (Bangs) Tower, the wife of Sylvester Tower, a manufacturer of piano actions and keys. They previously had lived in Cambridge. Their four children — Elizabeth Florence Tower, Herbert W. Tower, Etta Weson Tower, and Mabel Gertrude Tower – lived with them. Etta Tower married in November of 1897 to Henry Rich, a real estate dealer. After their marriage, they lived in Brookline. Etta Tower’s birth record indicates her middle name as Wellington; however, subsequent records indicate it as being Weson. Sylvester Tower died in December of 1904. Elizabeth Tower continued to live at 294 Commonwealth with their unmarried children, Elizabeth, Herbert (who was a piano action and key manufacturer in his father’s business), and Mabel. Mabel Tower married in 1911 to Oliver Willard Mink, treasurer of the Ames Shovel and Tool Company and of various other Ames family enterprises. They moved to 229 Marlborough. Herbert Tower died in January of 1922, unmarried. Elizabeth (Bangs) Tower and her daughter, Elizabeth, continued to live at 294 Commonwealth. Elizabeth (Bangs) Tower died in February of 1931. Elizabeth Florence Tower moved soon thereafter. The house was not listed in the 1932-1937 Blue Books and was shown as vacant in the 1932-1934 City Directories. On April 30, 1934, 294 Commonwealth was purchased from Elizabeth (Bangs) Tower’s estate by Francesca (Gentili) Cappelli, the widow of Enrico Cappelli, of Arlington. On June 26, 1935, 294 Commonwealth was acquired from Francesca Cappelli by Thomas J. Meldon, a funeral director who lived in Roxbury. In August of 1935, he applied for permission to convert the property from a single family dwelling into a lodging house. He subsequently abandoned the application. On June 26, 1936, 294 Commonwealth was acquired from Thomas Meldon by Margherita E. (Ercolani) Grilli, the wife of Silvestro (Silvio) Grilli, a manager and later vice president and manager of Pieroni, Inc. restaurant operators. The deed was not recorded until January 13, 1938, and Thomas Meldon remained the assessed owner through 1938. In August of 1936, Thomas Meldon again filed for (and subsequently received) permission to convert the property into a lodging house. Silvio and Margherita Grilli subsequently made it their home and operated it as a lodging house. They previously had lived in an apartment at 280 Dartmouth. By 1937, the Grillis had moved to an apartment at 440 Newbury. In December of 1937, they purchased and subsequently moved to 282 Commonwealth. On October 22, 1940, Etta (Tower) Rich and Mabel (Tower) Mink, holders of a mortgage on 294 Commonwealth, foreclosed and took possession of the property. Both were widows: Henry Rich had died in September of 1917 and Oliver Mink had died in November of 1926. On February 7, 1941, 294 Commonwealth was acquired from Etta Rich and Mabel Mink by Helen Elizabeth (Maclary) Baader, the widow of Albert Stanley Baader, as trustee of the Holden Realty Trust. On May 15, 1941, 294 Commonwealth was acquired from Helen Baader by Bror Oscar Dahlberg and his wife, Frances (Button) Dahlberg, who operated it as a lodging house. 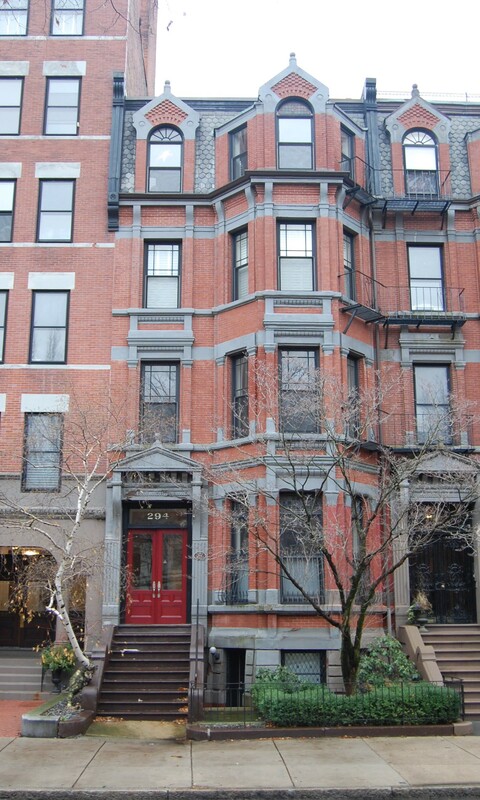 They previously had lived at 219 Newbury and, in the mid-1930s, had lived at 395 Marlborough. Oscar Dahlberg died in August of 1945. On March 15, 1949, 294 Commonwealth was acquired from Frances Dahlberg by Albert Leo Hollingdale and his wife, Margaret E. (Tabor) Hollingdale. They lived at 82 Bay State Road and also owned and operated lodging houses at 517 Beacon and 519 Beacon. On June 2, 1949, 294 Commonwealth was purchased from the Hollingdales by Elvira Lydia (Carpenter) Johnson, the widow of John L. Johnson, who operated it as a lodging house. She previously had lived in Maine. The property changed hands and on May 24, 1951, was acquired by The Zetadee Corporation. On August 17, 1951, the building was seriously damaged by fire. In October of 1951, The Zetadee Corporation applied for (and subsequently received) permission to repair the fire damage and change the legal use from a lodging house to a fraternity house. By 1952, it was the Zeta Deuteron Chapter (Boston University) of the Alpha Epsilon Pi fraternity. On September 29, 1956, 294 Commonwealth was purchased from Then Zetadee Corporation by Hyman Goodman. In October of 1956, he applied for (and subsequently received) permission to convert the property from a fraternity house into ten apartments. It appears the property may have remained a fraternity for several more years, inasmuch as the Alpha Epsilon Tau fraternity was listed there in the 1957 and 1958 City Directories, and was listed there along with ten apartments in the 1959 directory. On April 7, 1959, 294 Commonwealth was purchased from Hyman Goodman by Lawrence Clarke Hill, trustee of the L. C. Hill Realty Trust. He and his wife, Emilie (Parrock) Hill, lived at 396 Beacon. On March 1, 1978, 294 Commonwealth was purchased from Lawrence Hill by Mark C. Smith. He lived in one of the apartments. On July 14, 2000, 294 Commonwealth was purchased from Mark Smith by Garo-Boston Commonwealth LLC (Gary S. Rothkopf, manager of record). In May of 2000, prior to taking title to the property, it applied for (and subsequently received) permission to convert the property from 10 apartments into two apartments. On December 12, 2001, Garo-Boston Commonwealth LLC converted the property into two condominium uniis, The Residences at Two Ninety Four Commonwealth Avenue Condominium.